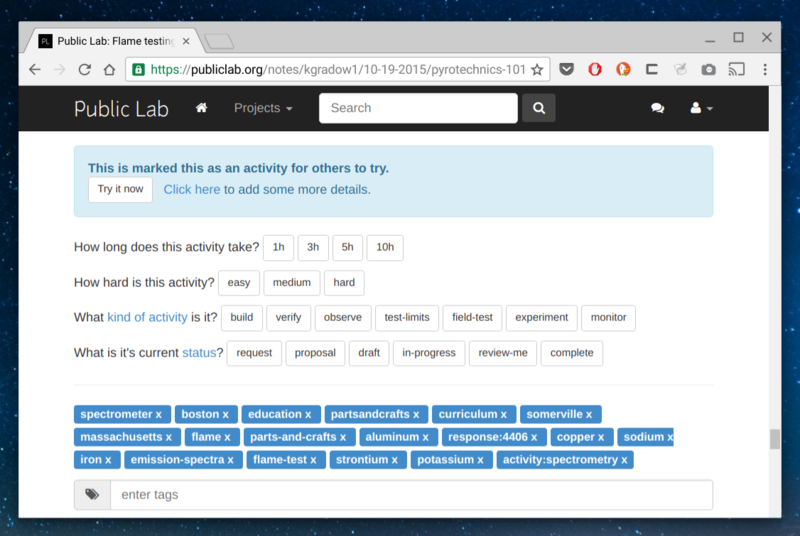 What are the first three activities that you would do with each of the Public Lab Tools? over urban waterways to track sewage in the water and discover what vegetation thrives on the edge. over contested urban areas to map local inhabitants narratives and perception of space. Taking a spectrum of the sky above your house, to see water vapor, O3, etc. If lots of folks are doing these activities, it would create large datasets that could be very interesting. For instance, if a first task for spectrometry is checking whether detergents have brighteners, with many groups trying this to learn spectrometry, Public Lab can collaboratively generate an archive of detergents with and without brighteners, that can be confirmed by multiple times. This would enable students to learn not only learn the method but also the value of repetition in science to confirm results. 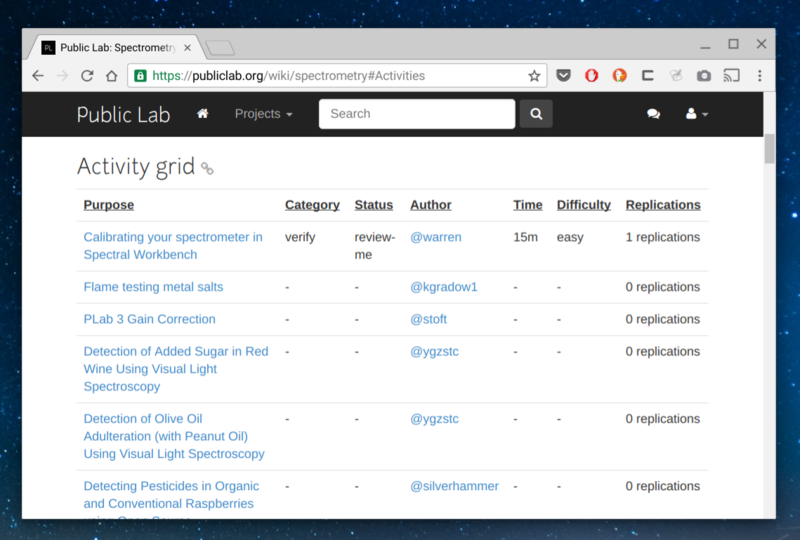 What are the first three activities that you would do with each of the Public Lab Tools? If lots of folks are doing these activities, it would create large datasets that could be very interesting. For instance if a first task for spectrometry is checking whether detergents have brighteners, with many groups trying this to learn spectrometry, Public Lab can collaboratively generate an archive of detergents with and without brighteners, that can be confirmed by multiple times. This would enable students to learn not only learn the method but also the value of repetition in science to confirm results. What are the first three activities that you would do with each of the Public Lab Tools? If lots of folks are doing these activities, it would create large datasets that could be very interesting. For instance if a first task for spectrometry is checking whether detergents have brighteners, with many groups trying this to learn spectrometry, Public Lab can collaboratively generate an archive of detergents with and without brighteners, that can be confirmed by multiple times. This would enable students to learn not only learn the method but also the value of repetition in science to confirm results.